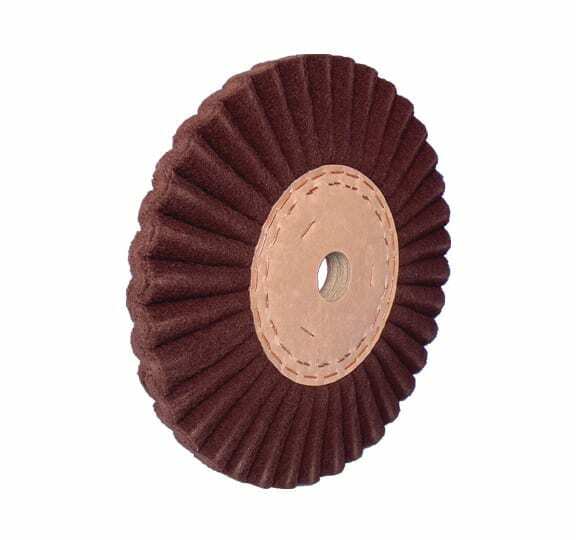 The non-woven grinding ring, manufactured with a special non-woven grinding material, consists of a regular shaft fold, which guarantees optimum tool life. It is the most aggressive non-woven abrasive ring from the Picard production range with optimum cooling at the same time. Non-woven abrasive rings with shaft folding are mainly used as wide rollers, which are composed of individual non-woven abrasive rings. Due to the precise folding, the individual non-woven slip rings can be lined up without aisle formation. During the machining process, an absolutely gapless and line-free surface is created on the workpiece. For grinding and matting all flat workpieces. This grinding fleece ring is mainly used on automatic grinding and polishing machines, but also for manual processing on the polishing stand.